Predictive assessment gives teachers a prediction of how students are likely to perform on state summative exams three, six, or nine months before taking them. The purpose is to allow teachers to use the information to understand each child’s strengths and weaknesses to improve results on those summative tests. Jefferson County (CO) Schools has used McGraw Hill/CTB’s Acuity since 2006 as part of its instruction, intervention, and assessment initiative. Acuity, which is aligned to state standards, is an integration of predictive and diagnostic assessments, reports, instructional resources, item banks, and item authoring. Implementation began as a pilot in two articulation areas. The district hired a team to implement Acuity, train teachers and administrators, help interpret the data, and—perhaps most important—assist teachers with developing and using instructional skills and strategies to change results. After one year, the Jeffco Board of Education approved a threeyear implementation plan, starting with the 25 schools that had not shown the highest gains in the previous three years. 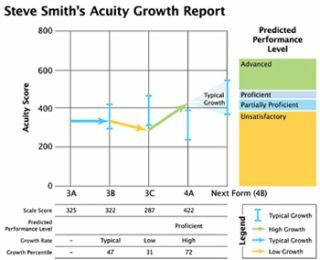 The Acuity predictive assessments in mathematics and reading are administered online in September, November, and April (right after the Colorado Student Assessment Program, CSAP). Teachers receive immediate information about student progress and growth, which allows them to predict student performance on the CSAP. They use this information to concentrate efforts where students need intervention. According to Vicki Ferrari, assistant director of assessment and research, the November assessment is highly predictive of the CSAPs. “Our teachers feel empowered that they can change the outcome for their students,” she says. Last year, Jeffco students were predicted to go down in reading at every grade level. When the chief academic officer saw the results, she was able to work with the instruction department to restructure the Principal Institute that was beginning the following week. The district leaders shared the Acuity data with the principals and the curriculum team asked them to do data analysis with their teachers and come up with a plan for their buildings. Each month, the principals shared ideas and progress reports. Ferrari’s team used Acuity’s customized assessments to develop probes for third- through eighth-grade teachers to give to their students before the state assessment. Because of this intensive process, the district maintained its reading scores in all but a few grade levels. Jeffco students outperform the state in all grade levels and content areas on the CSAPs, including reading and mathematics. Ferrari says using Acuity has improved teachers’ understanding of the relationship between instruction and assessment, and everyone receives the information they need to ensure that the district meets the needs of each student. One of the most popular ways to do formative assessment is with student response systems (SRS) or “clickers.” Using handheld remotes, a receiver, and assessment software, teachers can give a pop quiz or an already-prepared test. Students use the remotes to respond instantly, and the software tallies and summarizes the results, allowing teachers to adjust their lessons as needed. assessment. Teachers in Oak Park are using the system in various ways. Some like to ask students to click in last night’s homework answers; they can use the results to break students into small groups and help students who are struggling. Other teachers use the clickers for informal Q&A. Because the devices are anonymous, language arts teachers use them to broach sensitive subjects. “If the main character is going through a moral dilemma, a teacher can ask questions that spark a more honest conversation,” says Mintz. Summative assessment, which is cumulative, is used to determine whether students have met course goals or learning outcomes at the end of a course or program. Electronic portfolios (e-portfolios)—digitized collections of text-based, graphic, or multimedia elements archived online or on a DVD or CD-ROM—are a type of summative assessment that lets students showcase their skills. Third-, fourth-, and fifth-grade students keep their e-portfolios on flash drives that they purchase as part of their school supplies. Their portfolios include writing samples, artwork, and other projects. In sixth grade, they learn about blogging and start their own blogs, fine-tuning them in seventh and eighth grade as they learn more about blogging and showing off their skills to the real world. In high school, they continue to maintain their blogs based on their career goals. As educators across the nation increasingly incorporate 21st century skills into instructional strategies, they believe the federal government should support the development of new assessment models that effectively measure those skills, according to school district leaders surveyed previously by the National School Boards Association. More than 35 percent of respondents who attended the NSTA T+L conference last fall listed “assessing 21st century skills” as the top education technology priority that Congress and the Obama administration should address. More than 43 percent said their district already has created new assessment measures to incorporate such skills as problem-solving, teamwork, and critical thinking.